RGUKT Nuzvid/Idupulapaya IIT/IIIT Phase II and Selected students List at admissions.rguktn.ac.in/RGUKT Nuzvid/Idupulapaya IIT/IIIT Phase II and Selected students List opted Migration Certificates at admissions.rguktn.ac.in. At present, most universities in India and in Andhra Pradesh follow the affiliated college structure model where the main role of the university is to set the curriculum and conduct examinations to ensure that the students have indeed learned the material prescribed in the curriculum. Most colleges have an entering class of 100-300. Having an entry class of 6,000 students leads to issues of scale. This is unique to RGUKT and is being attempted for the first time in India. In the US, several of the larger universities do have enrolments of 20,000 to 30,000. However not all of them tend to be residential universities. Thus RGUKT, as a green field university, represents a unique experiment in the educational arena. A person born into a low income, rural family in India can't really aspire to study at an IIIT or aim to be selected into the IAS. This is true is many cases. It has been observed that, on an average, the marks obtained by the students in rural India are about 10-20% lower than the marks of students studying in private schools of urban India. As a result, most of the seats for higher education get filled by students from these private schools when the basis of selection is the marks obtained. Even if a rural student is capable, the educational system doesn't allow him to go ahead. The goal of RGUKT is to help remedy this unfortunate situation. 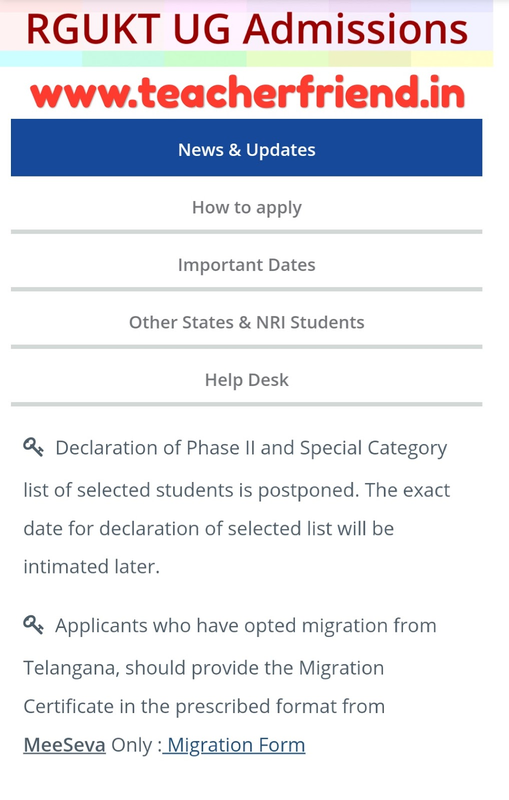 Declaration of Phase II and Special Category list of selected students is postponed. The exact date for declaration of selected list will be intimated later. Get Download Opted Migration Certificates Click Here. Get Download Phase 2 Selected Candidate list Click Here.